Reporting from the Winebow Annual Grand Portfolio Tasting. As usual a great event of a couple thousand fine wines from around the World. This guy always focuses primarily on the Italians with a few French, Ports, Champagne, and a few others thrown in here and there. The tasting did not disappoint and one big surprise from some friends in Greve, the Fiore Family led by father and famed wine maker Vittorio Fiore, son Jyuri (Vineyard Manager and co/Winemaker), and brother Roberto who was my first Wine-Salesman from Winebow when I had my Bacaro Bar Cichetti back in the late 90's. Well, I spotted Vittorio doing some tasting on his own and started up a little chat. Asking him how his sons Jyuri and Roberto are doing and he said his son Robert whom I haven't seen in years was at the tasting and was manning their table. So I went over to the table with Vittorio and said hello to Roberto. Of course I tasted their famed Super Tuscan wine Il Carbionone. Awesome as always. I spotted another wine on the table and as I looked at it, it seemed to have a typical Bordeaux labeling to it. But I also noticed the Podere Scalette log on it so I knew it was one of the Fiore wines. After tasting the Il Carbionone I asked Roberto if that was a new wine the had. He said, "Yes it's a special project form Jyuri (brother who is vineyard manager and c0-winemaker along with father Vittorio). Roberto said that Jyuri was a bit tired working with just Sangiovese and wanted to make a Bordeaux Style wine. So the Fiores planted some Cabernet Sauvignon, Merlot, Cabernet Franc, and Petitie Verdot. The wine, called Capogatto is make from equal parts of these 4 grapes. Well, let me tell you. The wine blew my mind. Awesome and perfect in every way. This wine had some nice flavor of all sorts of mixed berries both red and black and was in "Perfect Balance" of Acid, no harsh tannins, fruit flavor and nice medium weight. I loved it and told Roberto and Vittorio with all sincerity. And in the end, after tasting wine for another two hours, it was this wine that won top prize in my book for the best wine of the day, and I would give it a score of 94 on a 100 point scale. Absolutely marvelous. And speaking of marvelous, I've just to mention the dessert wines of Fausto Maculan, who makes arguably, Italy's best dessert wines of all, and they are his specialty. When I came upon the Maculan table I spotted Fautos's daughter Angela, said hello and asked her if I could try the Brentino which has a special memory for me, as I always remmeber when my cousin Joe and I drank it one night back at the Hotel after a long day of flying from New York to Milano, grabbing a car at the airport and driving to Bardolino to spend the night before heading to Verona and Vinitaly the next day. 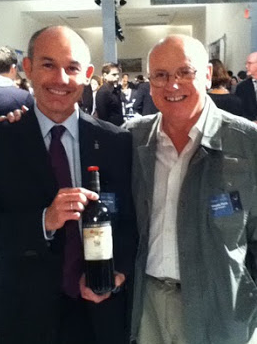 Anyway, it was Joe's first trip to Vinitaly and our cousin Tony was along with us as well. After we checked into our hotel, we went out for lunch, then went to a nice litle Enoteca where we had a couple glasses of wine with some Salumi and cheese. In Italy, in a wine bar (Enoteca) you can buy bottles of wine to take home as well as consuming in the wine bar. Something you can not do in the states. This place had some really fine wine and Joe bought a bottle of Brentino, along with a bottle of Guado al Tasso, and a bottle of Sassicaia. After lunch and the wine bar, we all went back to the hotel to rest-up before going out to dinner. We had a nice dinner, went to another Enoteca after that and drank a great bottle of Amarone Brigaldara. "Awesome." We then went to some little cocktail lounge and had a couple drinks before heading back to the hotel. We were back at the hotel for about 25 minutes when I heard a knock on my door. It was cousin Joe with a bottle of Brentino in hand. We popped the cork. We drank the Brentino and chatted about the day and the rest of the trip to come. It was just one of the great unplanned little time that you never forget. We had a great time drinking the Brentino and chatting at a hotel in Bardolino on the beautiful shores of Lake Garda 45 minutes from the Lovely little city of Verona. Just Great! So that's how I go off on a tangent about Brentino and drinking a bottle of the stuff in Bardolino at Lago de Garda. After tasting the Brentino, which was nice, but could never taste as good as the one in the Valpolicella Classico area of Italy with cousin Joe. "No way!" So I moved on to the renowned dessert wines of Fausto Maculan. I spot this wine Madoro and ask Angela if it's in the style of Recioto, the celebrated dessert wine of Valpolicella Classico and older brother of Amarone. Angelo said, yes it was in the same style but instead of Corvina, Rondenella, and Molinara, the Maculan "Madoro" is made from 80% Marzemina grapes and 20% Cabernet Sauvignon. I tasted it and absolutely adored it. Near perfection. The wine had a bit of sweetness but not too much. Just the right amount in fact. It was rich and full, and in perfect balanced. I Loved it, and put this in my top 6 wines of the tasting along with the Capogatto from the Fiore's, a tasty Cote de Broilly from Chateau Thivin, Maculan Dindarello, and Maculan Torcoloto. All fabulous, outstanding wines. Wines to get excited about. Anyway, it was on to tasting the Maculan "Dindarello" made from 100% Moscato grapes. The wine was in perfect balance and tasting of Orange Blossoms, Honey, and Apricots. Yummy, to say the least as was the famed Maculan "Torcolato" made from 100% Vespaiola and tasting of Peaches, Honey, and Wild Flowers. Again, ummy and close to perfection. Wow!